1. 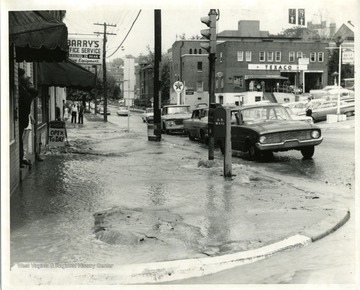 Beechurst Avenue Flooded by Broken Water Main, Morgantown, W. Va.
Beechurst Avenue Flooded by Broken Water Main, Morgantown, W. Va.
Beechurst Avenue in Morgantown, West Virginia is flooded by a broken water main. 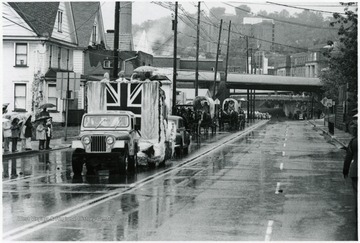 A truck in the parade carries a group of people down Beechurst Avenue. A man is being pulled by two horses down Beechurst Avenue. 4. 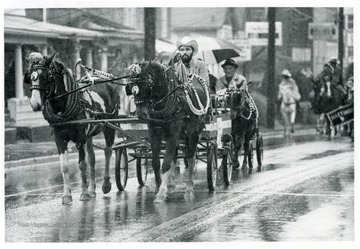 Monongalia County Bicentennial Parade, Morgantown, W. Va.
Two horses pulling a man down Beechurst Ave.
5. 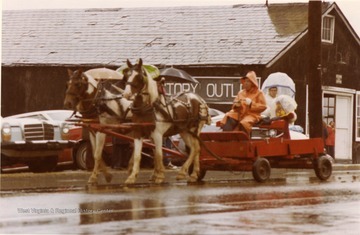 Monongalia County Bicentennial Parade Float, Morgantown, W. Va.
Monongalia County Bicentennial Parade Float, Morgantown, W. Va.
Two horses are pulling a wagon during the Monongalia Bicentennial Parade in Morgantown, West Virginia. 6. 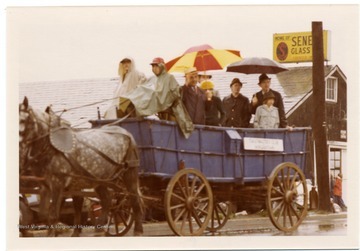 Monongalia County Bicentennial Parade, Morgantown, W. Va.
A float and covered wagons going down Beechurst Avenue. 7. 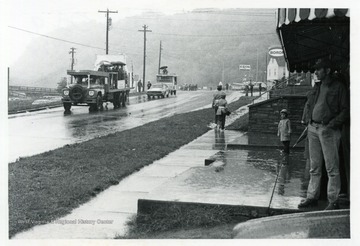 Monongalia County Bicentennial Parade, Morgantown, W. Va. 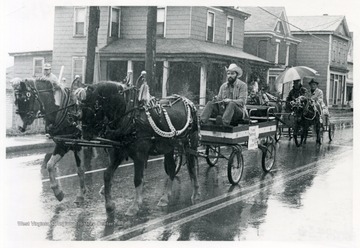 Horse drawn wagons go down Beechurst Avenue. 8. 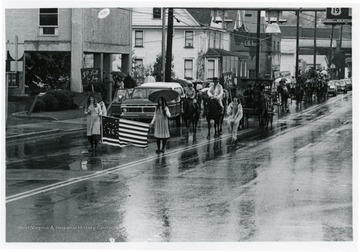 Monongalia County Bicentennial Parade, Morgantown, W. Va.
Two girls carrying a 1776 flag lead a troupe of people down Beechurst Avenue. 9. Monongalia County Bicentennial Parade Float, Morgantown, W. Va. 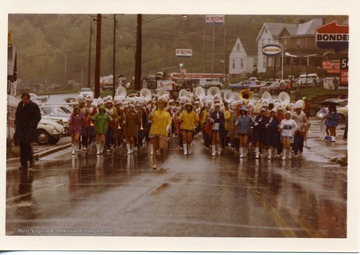 Marching Band in the Monongalia County Bicentennial Parade in Morgantown, West Virginia. 10. 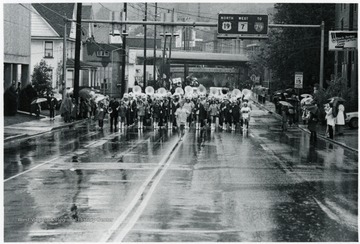 Monongalia County Bicentennial Parade, Morgantown, W. Va.
A band marches down Beechurst Avenue. 11. 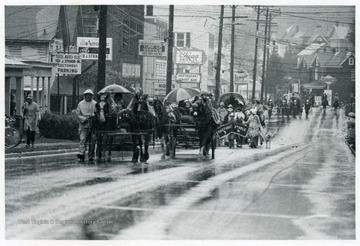 Monongalia County Bicentennial Parade, Morgantown, W. Va.
A horse drawn carriage goes down Beechurst Avenue. 12. 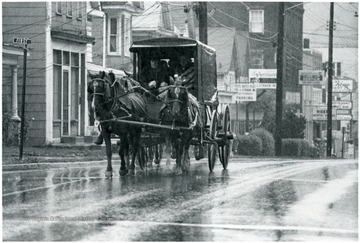 Monongalia County Bicentennial Parade, Morgantown, W. Va.
Two horses pull a wagon in the Monongalia County Bicentennial Parade.